As the light fades and the drift snow accumulates more on the summer vehicles an eerie sort of appearance begins to take over the outlying camp. Vehicles and buildings begin to look as though they have not been used in years, giving way to thoughts of abandonment and a spooky ambience. Such as looking at derelict home where people used to live, gazing over these areas that were teeming with people when we arrived in January just seems a little odd. It kind of looks like we are walking no where but there is a destination in mind. 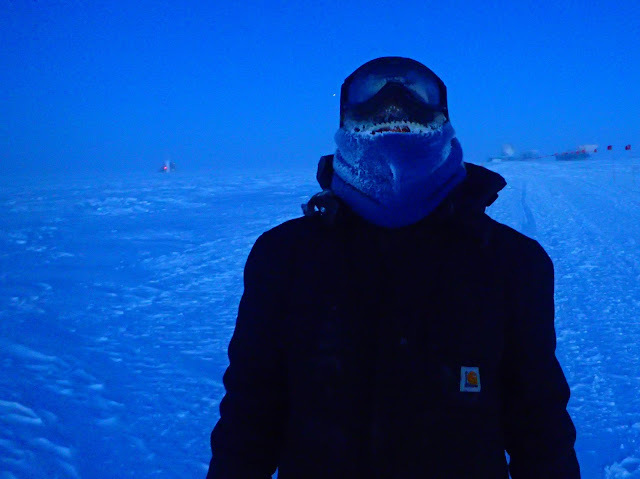 The drifting snow has been making walking a little more fun recently. Soon it will be headlamps and sticking to the flag lines when we walk outside to keep from getting lost. Ok so a little bit of an explanation on this one. In a previous post I am sure I've mentioned NASA is conducting a few voluntary experiments on the members of our wintering crew. Due to the extreme isolation it stands to reckon NASA might be able to learn a little bit about from how we react to our environment here in respect to people they will be sending into space for long periods of time. 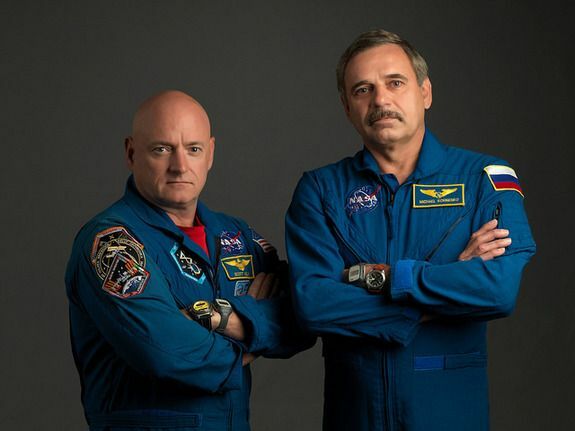 Some of us were watching a TV show about Mars and in this show they interview Astronaut Scott Kelly (pictured below with Mikhail Kornienko). Scott Kelly spent a year on the international space station and the rest of his life is part of a study to see what long term effects there might be from someone spending such a long time in space. 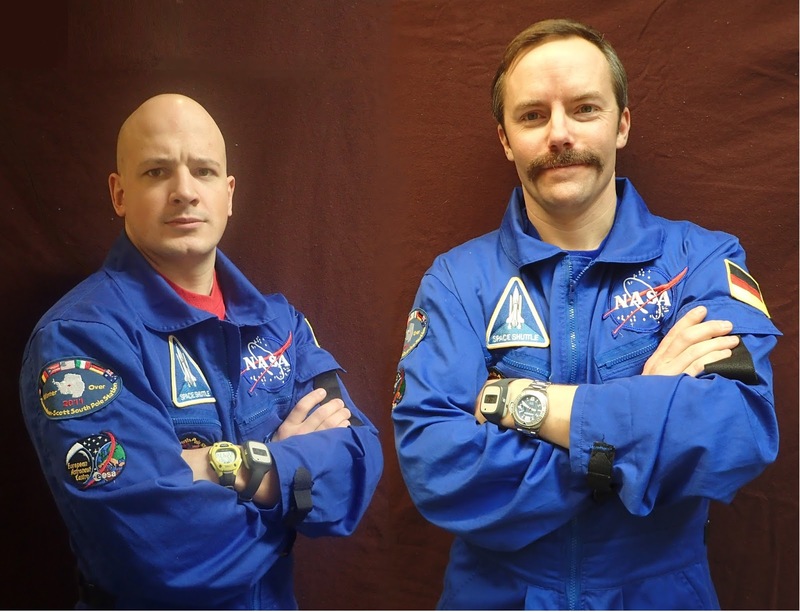 Imagine our surprise when we saw video footage of Scott Kelly in space wearing the same watch we have to wear for our NASA study! We were more than a little excited and it was not long before one of our group noticed the slight resemblance of two of our group to this photo which had been posted a few places on base in reference to the study. Naturally one of our guys, thanks Robert, has his own space suit for a space party we have each winter and he was kind enough to let us borrow it. A quick photo or two, a little bit of photo shopping (we only have the one suit! ), and you have the result you see before you. Despite Scott Kelly being in no way related to our study at all, I've tweeted and facebooked Scott Kelly in the hopes of a laugh from him but no response yet. The photo is our attempt to honor these men and what they have done. I told you it was good food! Bison steak, duck, pumkin, kale... oh my!! Our station manager giving a toast as we sat down for dinner. 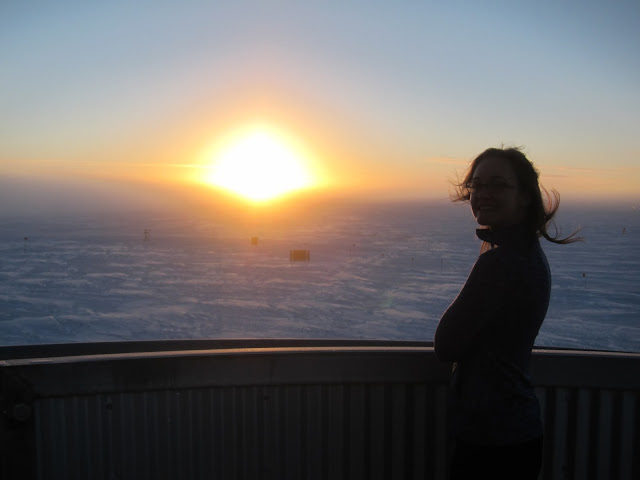 We really have enjoyed our stay at the Amundsen-Scott South Pole Station so far. Hopefully the pictures show just a little bit of the beauty that exists down here. It is a strange place to live. It is tempting to forget just how dangerous it can be minus the life saving resources we have protecting us from Antarctica. And yet knowing where we are leaves a significance that goes beyond any of those dangers and leaves one feeling as though you are a part of something truly special. I am sure some of us, including myself at moments, miss this and it can become quite difficult. If we can keep our focus, however, I believe we can see beyond and into the contribution this base is making towards humanity and science.